What Did I Ever Give You? It's still good, but I'd call this their weakest album yet. So many of the songs were average, and there's nothing here which is a real standout. Oddly, I was unable to shake the feeling that this sounded like Silverchair's Young Modern for quite a chunk. Ein Rückschritt für mich, leider ziemlich schwach herausgekommen, es fehlt dem Album ein Hit! I think this is a good effort but I don't think it's as good as their 2nd album, which I haven't heard it some time. Highlights in "Little Shocks" & "When All Is Quiet". 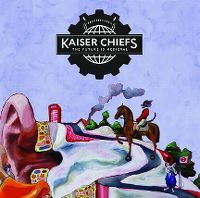 Alweer een aardige plaat van Kaiser Chiefs, al kunnen ze beter. Maar iets meer verkocht mag deze plaat toch wel worden. Auf der Homepgae hat man die Möglichkeit aus 20 Songs zu wählen was wiederum bedeutet, es hat rechnerisch gesehen die Möglichkeit zu 184.756 verschiedenen CD Versionen. Das Material selbst ist dieser Zahl nicht würdig, Wave-Pop aus Leeds für das 4. Album das masslos enttäuscht. Gut, meine Erwartungen waren ohnehin nicht allzu groß, aber das Ergebnis ist doch ärgerlich. Durchweg solides, bis gutes Material. Allerdings ohne Knaller a la "Ruby" oder " I predict a riot". Schade. It goes without saying that this is quite a shift in sound. I'd say that this is my least favourite of theirs (disregarding what I've previously said of course :P). There's nothing too bad on this, it's just lacking in that power they've previously had. Not a bad album they have definitely done better with their previous stuff.